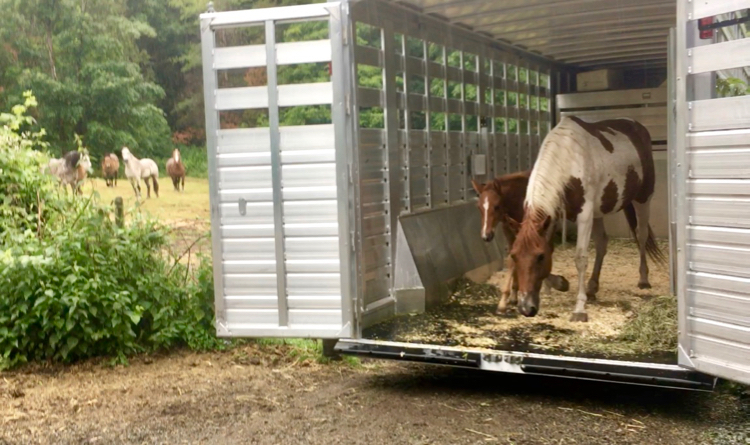 Here’s the story of my very first horse trailer purchase and our very first haul, picking up our wildie, Siyone, and her filly, Posa. And what Siyone thought about my choice! It took me two full years to decide which horse trailer to purchase; two years of online research, visiting trailer sales centres, renting trailers to try them out, hiring haulers to move my horses anywhere from 20 minute journeys to 6 day journeys – and seeing how my horses responded – and talking to everyone I knew who already had a trailer. Then I had to imagine I was a horse, and from that perspective, think about what I wanted for my horses, that would enable them to not loathe the trailer. And at very best, perhaps even enjoy getting in the trailer – once they knew it lead to fun adventures! Just because I can train my dog to go in a crate so small he can’t fully stand up, doesn’t mean I should. And just because we can train horses to be content (i.e. not kill or injure themselves) in 10×12′ stalls and 4′ wide slots in trailers, doesn’t mean we should. When I observed my horses’ natural behaviour and watched which parts of the barn they felt most comfortable in, it became very clear that the higher the ceiling and the wider the space, the better! As evidence for which kind of trailer a natural horse can tolerate, we can look at the minimum horse trailer standards set out by the BLM for transporting mustangs. Animals ride loose inside your trailer, and must have adequate space to turn around. There must not be any trailer feature or object that the animal could attempt to jump over, or get caught in; for example, mangers, length-wise dividers, bars, hay nets, etc. You want an open and empty box-stall type area. 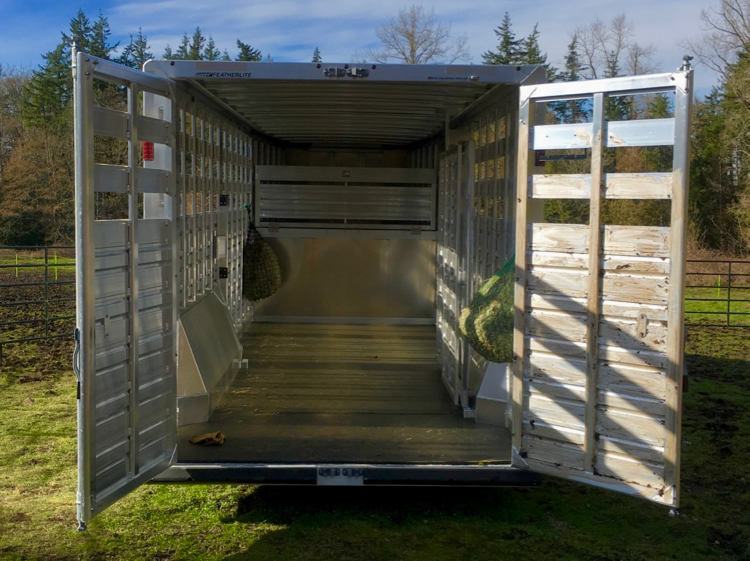 Trailers must be stock type with a full rear door that swings from the side so that the animal steps up into it – NOT one that has a drop down ramp. The front and top of the trailer must be solid or covered to block the wind and rain. Trailers must be in good repair, safe, and have good working latches. Slant-load trailers: Slant dividers must be removed or secured to the side of the interior wall, to leave an open box-stall type compartment. Stock-trailers: Can have one compartment, or several. The compartment cuts must be made with a swing center gate, making a front and rear box-stall type compartment. Another aspect I looked at was how MY body felt in the different trailers. I am more like an animal in that I get claustrophobic easily, and my senses are extra heightened (I’m one of those supertasters, in addition to having extra sharp smell and hearing – not usually a benefit, by the way). I can also feel the energy flows in spaces (more of a benefit as it’s helped me make some money in real estate). So every time I’d hire or rent a horse trailer, I would go inside and see how I felt. Some of them I would literally NOT want to step inside at all! Light is hugely important, as is ceiling height, and the more width, the better. 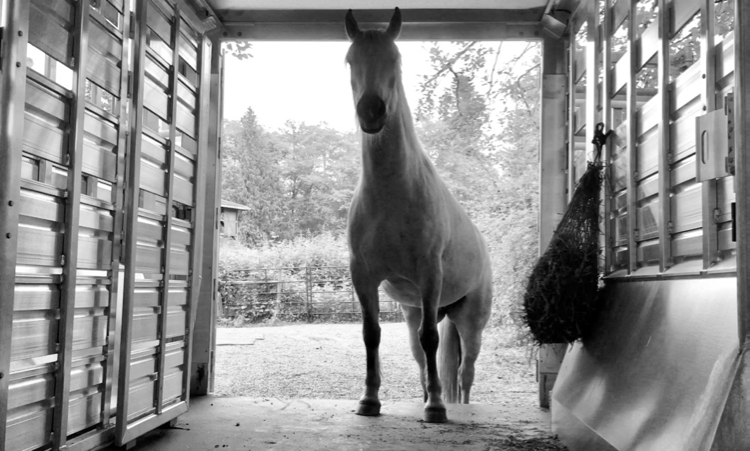 Since I have tall horses, 15.2 – 17 hh, the minimum trailer height I would consider is the ‘Warmblood height’ of 7’6″. Yes, that six inch increase makes a huge difference to how you feel inside the trailer. The other bit of advice I gleaned from people who trailered often in this climate, was to pay for the electric jack (to raise and lower the trailer hitch). When you’re in a damp climate where everything rusts or erodes, that trailer hitch just gets more and more difficult. And all it takes is the smallest finger, wrist, elbow or shoulder injury and you’re not going to use your trailer. The next thing I looked at was pricing. Honestly, I cannot believe how much people sell old, rusty, diarrhea-stained secondhand trailers for! It seems the normal, free market economy rules, just don’t apply to horse trailers. The price difference was just not big enough to make it worth purchasing a secondhand trailer. Combined with that fact, the trailers up here in Canada cost a lot more than driving 10 minutes across the border and buying the same trailer there. Even with import duties, the savings were significant. The other issue I ran into is that stock trailers are not popular in Canada. Even new stock trailers were hard to come by. So then you pay a ton of money for a Warmblood-height slant-load trailer with tiny windows and 4-foot wide stalls. What?? 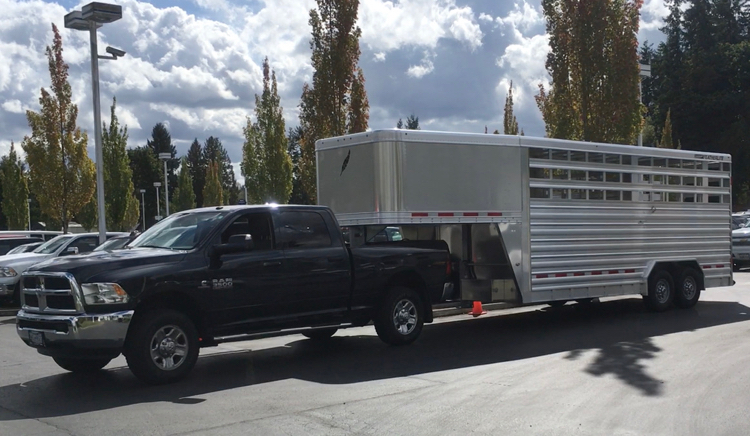 I realized the best solution for me was to order a custom-built stock trailer from Washington – that way I could get everything I wanted and pay the least amount of money for it. Featherlite seemed to be the best balance between a well-built trailer, with all the options I wanted, at a competitive price. Then I found Bickford Trailers in Snohomish, WA and they took almost $5K off the nearest competitor. Audelina (purebred Belgian) says that Yes, the trailer is big enough for her! The salesperson at Bickford, Maggi Clark, was an absolute treasure trove of information as she is a lifelong horseperson who has also bred Warmbloods for decades. So she hauls horses all the time and made numerous helpful suggestions, like this: At first I wanted a 16-foot trailer, as that felt really “easy” for me to drive around with. That would give me two 8-foot box stalls. But then I saw a 24-foot trailer on the lot and thought, “Oh, that’s big enough, in an emergency situation, I could actually haul all 5 horses.” So then I wasn’t sure which length I should get. She also told me that if my horses got along, I could fit 5 of them loose in a 20-foot trailer. Well, I decided it was better to push my psychological comfort zone a bit and go for the 20-foot (which gave me two, 10-foot box stalls), rather than the 16-foot. But not make life difficult by going for the 24-foot. 1. Featherlite custom stock trailer with THREE rows of open slats at the top – this gives it a really nice, open-air feeling and lets in lots of light. Most stock trailers only have one or two rows open. Unfortunately, Featherlite only offered dark smoke-colored, or red (!) plexiglass to slide in the slats (to close them off in case of rain). So I didn’t order any, but Maggi got me a sample, so I can get any plexiglass shop to custom-make them for me if I want them. 2. I had them make the trailer 8-feet high and 8-feet wide to give the maximum amount of space. If you go higher than that, the price increases hugely because they have to add extra reinforcements to all the walls. But I have to say, 8′ high is plenty big enough – in fact, it feels huge because the 8-feet starts at the top of the wheels! 4. I chose a goose neck (rather than a bumper pull) as that is more stable to pull, but also easier to back up and park – Maggi’s recommendation again. I can also park the trailer in their field, unhook it from my truck and the goose neck jack is heavy-duty and stable enough that I can work with the horses in the field, without concern for the trailer tipping if they panic, or wrestle inside it. Tip: If you have an older trailer, then in addition to putting the jack on a concrete block, you should also put stable blocks under all 4 corners of the trailer, and of course, block the wheels so they can’t roll forwards or backwards – if you’re loading horses without having the trailer hitched to your truck. 5. Yes, I ordered the electric jack (runs off a battery that gets charged when I drive), exterior lights, some tie-hooks on the outside, rubber step guard for the horses getting in, and rubber mats on the inside. 6. I wanted 2 doors, rather than 1 big one, as not only are they easier to close, but once your horses get used to loading, you only have to open one door. However, as these doors notch/hook both at the top and bottom of the door, and the trailer is so high, if the door warps at all over time (or gets kicked) it’s going to be difficult to hook the door in at the top. So, I’m actually not too keen on that design. 7. Side door at the front of the trailer – not only does this give me easy access to the horses, it also makes it easy for me to get to the storage area at the front. This front area (that extends over the truck bed) is big enough to fit a queen size mattress, or at least 10 bales of hay. My entire trailer is aluminum silver in color. So while this makes it nice and light, when the sun hits it, it can reflect off quite sharply and white actually would have been better. Apparently aluminum naturally dulls over time and after spending the winter in the middle of my field, it is definitely less shiny, so that’s good. Then I smeared mud all over the back doors to further reduce any reflection/glare at the entrance and that worked well too! For those of you digging into the nitty-gritty of ordering a trailer and going through every spec, here is the itemized order quote for my trailer. Make sure you get a salesperson like Maggi who can explain what every item/term is and also give you recommendations based on personal experience. For the trailer’s first trip, we drove two hours up and down winding mountain roads to pick up Siyone and her filly Posa – the two newest members of the herd. Siyone is a wild mustang from a cull off a Reservation in Northern BC. 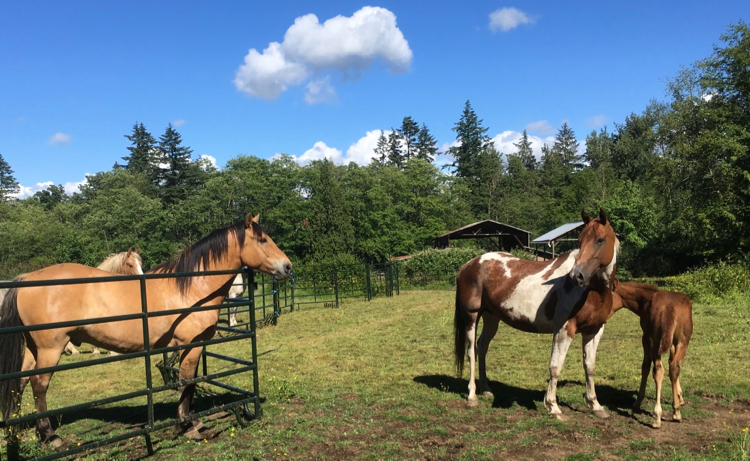 The rescue owner, Kris, has been working with them for a couple weeks with a white 3-horse stock trailer – giving them grain in the trailer every morning. We pulled up with Big Bertha here and all four horses went on and off about 4 or 5 times. Then Siyone and Posa loaded in about 30-40 minutes and stood there calmly at the back while we closed the center gate. It was pouring rain and no glare off the aluminum whatsoever – if wildies will get in, unhaltered and free choice, then you know you’ve got a good trailer! Whew. During the ride down, Siyone rode with her bum tucked into the back left corner (so head facing the back of the trailer) – just like Maggi said they would. She specifically told me that when you allow horses to be loose in a trailer and position themselves in the best way for their body to stay stable and comfortable, they will face backwards and slant across the trailer. She advised me to hang hay nets to accommodate this preference, and so I did. Note: After hauling 4 horses, I discovered that every one of them put their bum against the inside (driver’s side) corner, angling their body on a cross-wise slant, facing backwards, and ate from the hay net at the outside (passenger side) corner. I had hung hay nets on all 4 sides, front and back to allow them to fully choose their position – and they all independently (separate trips) chose the same position. One last thing I want to mention: The reason many people put blinkers on horses as they say it prevents them from being distracted or scared by everything happening around them. I feel like this same mentality exists with horse trailers – almost like people feel if the trailer is too open and the horse can see everything, they will just get freaked out. However, that doesn’t ring true for me and it’s not how I approach my herd, nor is it what my herd have shown me to be true. Perhaps that works for the dissociated horse, or for the horse trained to learned helplessness or stoicism. But for an empowered, enlivened horse, knowledge is power. As we’ve discussed before, horses are actually not flighty, reactive animals; humans have made them that way. 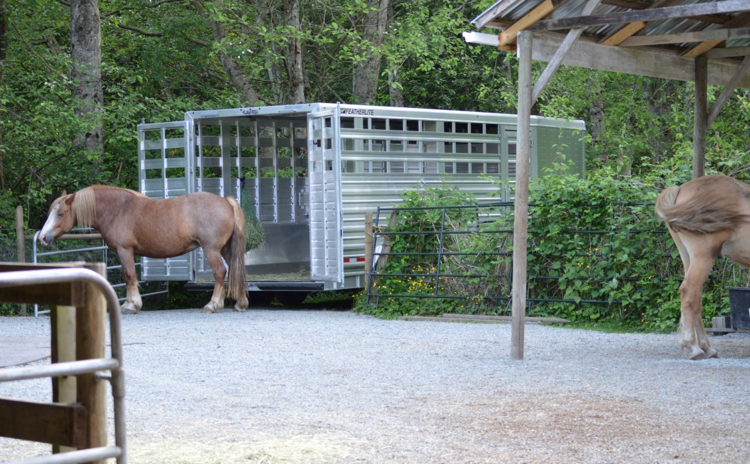 So when you put a wild horse in a trailer like this, with 3 rows of open slats, and full visibility… guess what happens? The horse is pretty calm because she can see everything around her – she is not just hurtling through space in a darkened cave, hearing and smelling and feeling everything, but not able to see it. We also forget that horses’ sense of smell, hearing, and vibration/resonance is also about a thousand times more acute than ours. So… we think that by limiting their sight we’re actually going to prevent them from knowing what’s happening?? Of course not. But we’ve just made it more difficult for them, we’ve handicapped them – and perhaps they’re now wondering why or are mistrustful of us? And we’ve also made the trailer ride a helluva lot more boring! If you travel with your dogs or cats in the car, then you know that they all love to look out the window as you drive. Why would your horse be any different? I’ll bet Siyone was amazed to see the ocean as we drove along the coast right next to it. She was able to see and smell the ocean for the first time in her life – how wonderful! The only time Siyone signalled distress during the entire trip (by stomping and shifting her weight around) was when traffic slowed right down on our side of a 6 lane highway, we were in the far left lane, and oncoming traffic (just across the median) was whizzing by at normal high speed. It was very loud and quite a lot of reverberation each time an oncoming vehicle passed – which was every second or two, as we were in rush hour traffic. We received her message and moved over one lane and she settled right away. When we saw how much hay she’d eaten, we knew she’d had a pretty good trip down! The second time she stomped and jostled around was when we turned onto the barn road and she saw the herd. She knew we were home and wanted to hurry up and get out! She also caught site of her herdmate, Makah (we think Siyone might be Makah’s mother), and they were whinnying to each other while she stomped. Hopefully, when we head back to Squamish again, Kaliah and baby Xadaa will load in the trailer just as easily. But if not, if they need some time to practice going in and out and spend some time just standing and eating in it, then I will just leave the trailer there, until Kris thinks she’s ready. Happy to be home. Baby Posa feels grass under her feet for the first time in her life! OMG, this is gorgeous!! Everything from your description to the ride home and how everything went! Yay! Congratulations in getting members of the tribe home little by little…. Probably best than all at once! I have been looking at trailers and I am grateful for this. It obviously addresses considerations that many other people don’t. My mustangs even when pretty feral did really well in a variety of trailers (not me driving them), from slant, to loose in one, etc, but of course that’s just my interpretation…. So I am not sure what we’ll do. 7-8 hours is a long time to stay in the “wrong” position, with a halter on that bounces/pulls on your face 🙁 and can be exhausting. On the other hand, I won’t find anyone who will let them ride loose and I am not prepared to purchase a trailer now….but soonish maybe. 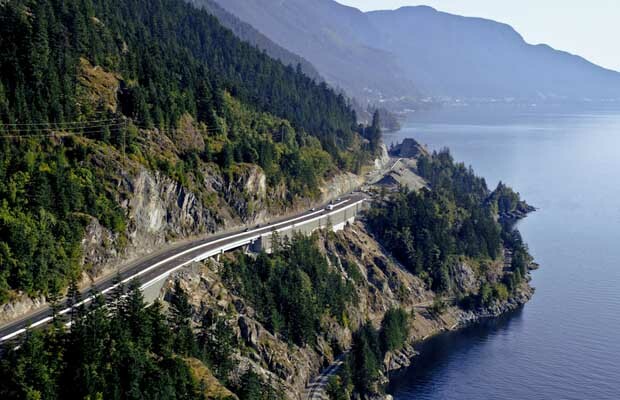 Oh Vittoria, in a perfect world I would LOVE driving and would bring my trailer to Oregon for you! Unfortunately, it is one of THE most stressful things (along with flying) for me and I only do it when there is no other option! I’m wondering though… if you can find a cowboy-type guy… wait, there are a couple of BLM Rescue groups on Facebook in Oregon. If you post on there, they might know people with stock trailers willing to haul loose. Do you think all 3 could go loose together in a trailer? Or would Leilani need to be separated? I think you gotta do a search on people used to hauling mustangs – so they don’t have that ‘fear’ of horses not being haltered. That screwed up both Montaro and Aude so bad! Because the person who owned the trailer insisted they be tied. Oh, thanks Jini! Yes, I actually thought of you coming down, but I knew it was absurd, also considering your schedule. And it’s truly a lot… a long journey! I will do what you suggest. Funny because the guy that I have so far IS a cowboy type, and from Texas to boot! I think all 3 horses can be loose in the trailer and Leilani would be ok. Her and Denali are pretty good together, and Dakota is so easy going with everyone. But this person is probably not going to agree also because he’s going to have other horses in the trailer. I’ll look into your suggestions! Thanks! Ah well, unless there’s dividers, I would not put them in a trailer with unknown horses anyway. That could go horribly wrong, very quickly. If I were you, I would set my intention for a trailer just for them, where they can all ride loose and you can put 4-5 hay nets in there so there is hay wherever they choose to stand. Also, ask your hauler how often s/he plans to stop and let them rest – and how long the rest stops will be. Also, very important question, ask in advance, “If the horse(s) refuse to load, what’s your policy?” Some haulers will not charge you a dime, others will charge you full price, so find out in advance. Oh Jini, I hope they don’t refuse to load! Ha! D & D never have, but Leilani is kind of spunky, and even though she unloaded well when she arrived, she’s now strong and determined 🙂 We’ll see. I am talking to them a lot about the move already….I actually was thinking of moving them sooner to a place up there (already secured) but moving them twice does not make too much sense, since they are good here. I’ll look into the hauler who would let them travel loose…. I agree, no other horses in the trailer…. Thanks! Awesome Kenneth! My next plan is to ride in the back of the trailer myself, while someone else drives. I want to see what it feels, sounds, etc. like at high speeds, over bumps, etc. And I want to know if anything differs between the front and back of the trailer. I will stand free – without hanging onto anything and see what my body needs to do to balance. I also want to see how windy it is and whether I should put in a row or two of clear plexiglass to cut the wind. Will be interesting to find out! Recently I have been thinking about getting a horse trailer and I wanted to look up some information. I really appreciated how this article talked about looking at the ceiling height, and the more width the better. I will have to keep this in mind as I search for the right horse trailer. You’re welcome! I was in there today with one of my horses loose – I was in the back and he came in to join me and it didn’t feel squishy at all. I felt very safe, with lots of room to maneuver around him! I didn’t know that if a trailer was too small, the horse could injure itself! That is good to know and I like how you phrased it as trailer freedom! I will measure out my horse the next time I look into getting a trailer for her!